The energy produced by the four lower Snake River dams could be replaced by a mix of other clean energy sources, according to a study published last week. The study was commissioned by the NW Energy Coalition and conducted by Energy Strategies, a Utah-based company. 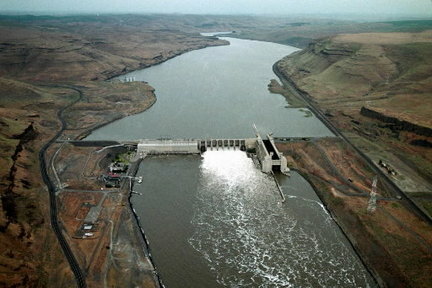 The study used the Bonneville Power Administration's data. Removing the dams would cost users about $1 extra a month, according to the study. The study recommends replacing the power produced by the dams with a mix of wind and solar power while also encouraging users to cut their use during high-demand times. "The region can remove the four Lower Snake River Dams and replace the power they provide with a portfolio of conservation and renewable energy resources while maintaining grid and transmission reliability at levels equal to or better than the current system and with little or no increase in greenhouse gas emissions," states the report. The four dams considered in the study are Ice Harbor, Lower Monumental, Little Goose and Lower Granite. "Even using BPA's own numbers and a very conservative analysis, this study shows that replacing the energy from the lower Snake River dams is doable and affordable," said Sam Mace, the Inland Northwest Director for Save Our Wild Salmon in an email. The dams provide about 4 percent of the region's electricity, according to the report. At the same time, the dams have been responsible for declining salmon populations. Some dispute the study's findings. "There are a number of problems with (the report)," said Todd Myers, the environmental director for the Washington Policy Center. "They are playing many games all at once." Myers said that after reading the study he believes the amount of energy the report predicts Washington and Idaho would get from wind and solar are "not realistic." Additionally, he said the calculated cost to taxpayers was misleading, among other things. "It doesn't actually replace all the electricity. The Co2 emissions would actually go up and their cost estimates contradict the studies they cite," he said. In an online blog post refuting the study, Myers wrote, "although the study isn't a useful tool for public policy guidance, it illuminates the lengths some will go to in order to push an agenda even when the data are not on their side." U.S. Rep. Cathy McMorris Rodgers, R-Spokane, has introduced legislation, HB 3144, that would protect the four dams from removal. One part of McMorris Rodgers' argument for preserving the dams is the power they provide. That is just one argument for keeping the dams, a spokesman for the congresswoman said. The dams allow farmers in Idaho and Washington to ship their crops using barges, and provide some flood control, among other things. Barge traffic has declined in recent years. Rep. Joe Schmick, R-Colfax, said the dams remain important to his constituents as does barge traffic. Additionally, he's skeptical that the power produced by the dams can be replaced cheaply. "There are real costs to doing this (removing dams) and costs to everyone," he said. The energy study comes on the tail end of a busy two weeks for dam and salmon issues. On Monday, a U.S. appeals court ordered dams on the Snake and Columbia rivers to spill more water to help protect salmon and steelhead and aid their migration to the sea. In late March, a poll was published showing that a majority of Washington voters would rather see increased wild salmon runs than preserve four lower Snake River dams. McMorris Rodgers' bill will likely receive a floor vote in the House of Representatives within the next two months. Lisa Brown, McMorris Rodgers' democratic challenger, said she doesn't support the bill, but she doesn't support dam removal, either. Instead, she believes the bill puts too much control in the federal government's hands. She advocates for a regional stakeholder decision making process, one that "determines how to move forward in a way that consults the best scientific and biological studies for managing dams to maximize the chances of salmon survival. "(The bill) presents a false choice: that we have to choose between keeping our dams or preserving our salmon," she said in an email. "We don't have to make that choice, and most people in eastern Washington want the benefits of hydropower and they do not want native salmon to become extinct." Advocates of dam removal say the energy study is just one more indication that the four dams on the Lower Snake River can, and should, go. "I have a lot of hope for the future and this study again reaffirms what has been known for years and for decades," said Josh Mills, a board member of the Wild Steelhead Coalition. "These damns have kind of outlived their usefulness. And that this fear of loss is not necessary."